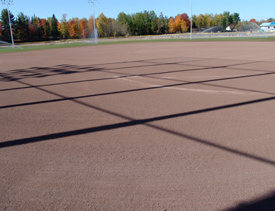 Pro Diamond Infield Mix is a high quality blend that allows for professional playability. Pro Diamond Mix provides firm traction, moisture retention, moderate drainage, uniform gradation, a safe playing surface and the autumn red colour makes it easy to see the ball as well as being aesthetically pleasing, is granite based requiring less top-ups. U.S. laboratory test results show that Hutcheson Pro Diamond Mix is comparable to the highest quality infield materials available, making it the perfect choice for hardball & softball diamonds as well as your little league fields. Granite Infield Mix is a unique blend of granite and clay, producing a deep reddish colour that delivers a safe playing surface, firm traction, dependable bounce, moderate drainage. Our Granite Infield Mix is perfect for facilities with restraints on maintenance budgets and requires less top-ups. Muskoka Infield Mix is a engineered blend of granite sand, fired clay and raw clay which provide a safe playing surface with dependable bounce, moderate drainage and is easy to maintain. 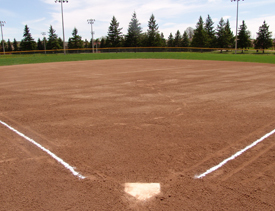 Standard Infield Mix is a blend of sand & aggregate materials that is safe to play on, drains well, and is low maintenance. This mix is an excellent, higher quality alternative to stone dust or limestone screenings. Granite and Clay Warning Track materials can be colour matched to the infield, while the coarser gradation gives the ‘crunch’ that warns outfielders of approaching fences as well as providing good drainage.